With no added artificial colours, flavours or antioxidants. Wholesome Turkey with Rice and Vegetables is rated 5.0 out of 5 by 1. Some dogs can be quite sensitive to changes in their food, others adapt more quickly. You know your dog best but to minimise any digestive upsets we recommend gradually changing from one food to another. 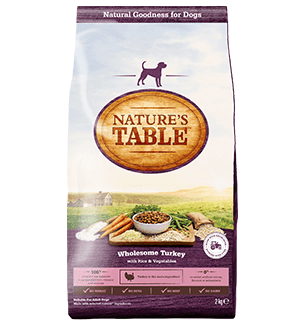 If you are feeding a product from the Nature’s Table™ Dog food range for the first time try to gradually change food over a period of 5 to 7 days. Each day replace some of the old food with a little more of the new food, until after a week the new food has completely replaced the old one. Store closed in a cool dry place.